Charming newly renovated apartment located in the heart of Turin. 55sqm apartment brand new, newly renovated, in a central location a few steps from Via Roma, Piazza San Carlo, Piazza Castello, Porta Nuova, Egyptian Museum, Palazzo Madama, Royal Palace and the Royal Gardens, Duomo, Teatro Regio, Palazzo Carignano, La Mole Antonelliana and cinema's Museum. Suitable for couples or families with 2/3 children for business trips or tourism. The apartment, very quiet, is located in the center, in the pedestrian area, on the first floor with elevator in a period building protected by fine arts, very elegant and well-kept in the common areas. Fully refurbished for a few days, with particular care and is equipped with every comfort: wi-fi, safe, air conditioning, kitchen area equipped with fridge, fires, Nespresso machine for coffee, dishwasher, washing machine. High chair on request. 2 tennis rackets, 1 Kway + 2 ponchos for the rain. The balcony of the railing is equipped with a coffee table and 2 chairs. Guests have at their disposal a living area with a pull-out sofa-bed, a TV and a bedroom with a queen-size bed and a pull-out bed, an armchair desk and a TV. Antibag, bathroom with shower. The apartment is complete with household linens (linens, duvets, towels, tablecloths), crockery and pots. The bedroom has 2 wall cupboards with hangars and shelves. We are available for any information or need during your stay. The neighborhood houses shopping streets, Prada, Miu Miu, Luis Vuitton, but also Eataly and Gobino. Vividly full of restaurants, cinemas, fashionable venues and many events. Located in the heart of the city, opposite the Grande Hotel Sitea, 250 meters from the Egyptian Museum and 400 meters from Piazza Castello, 10 minutes' walk from Porta Nuova Central Station and about 20 minutes from Porta Susa Station, half an hour Taxi to Caselle Airport. 3 Parking lots nearby. Bike sharing "Tobike" around the corner. No jokes and behaviors that do not respect the neighborhood are allowed. Minimum stay: 1 night and 2 NIGHTS IN THE WEEK END - August MINIMUM 1 WEEK. It is not allowed to have parties. It is only possible to receive people after they have previously communicated their identity and agreed on the reason for the visit. For smokers there is a special corner on the balcony with table and chairs. Please do not damage the bed linen, sofa and armchair with cosmetics, ointments, hair dyes, acids, inks, oil, food, and more, and do not use either the desk or the desk In glass as a stand for the suitcases. The lights and TVs should be turned off when you leave the house. Finally, please report any damage or breakage immediately so that you can remedy it immediately. For everything else ... you are welcome. Fabulously located, clean little apartment. 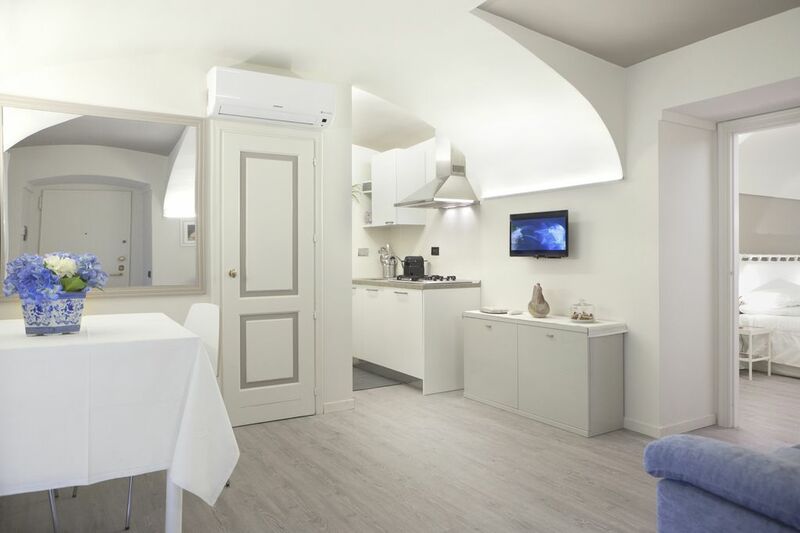 We loved staying in this clean little apartment, located ideally in the center of the old section of Turin, where much of the area is a pedestrian zone. Just a short walk from the Egyptian Museum and Porto Palazzo as well as many restaurants. Carla met us when we arrived and when we left. The apartment features two rooms, one with a double and a single bed and onw with a pull out single couch/loveseat and small kitchen. The pictures make them appear somewhat larger, but they certainly were all we needed. The shower is quite small, but what is expected in a city apartment. Wifi was adequate. It has a TV which we did not use. I appreciate that things like salt and other condiments were provided as these are annoying to buy. There is an elevator, but the stairs are just one short flight. There is a washing machine on the balcony but no dryer. I found it easy to hang the few things we needed to wash. The area surrounding the apartment was perfect. We walked to a restaurant which was further away, and I would not have like to stay in the area where it was. There are many pedestrian zones close by with several restaurants including 3 Michelin Star (we ate at Il Cambio). The parking is 1.50 Euro per hour, but is located just around the corner from the apartment in an area with a guard. Our car was really safe there. Overall a fantastic experience in Turin. Highly recommended! Thanks for the nice and comprehensive review. I was very pleased to meet you, you are a wonderful family. I am very happy that you enjoyed staying in my home and enjoyed my city. You are highly recommended for me and I hope to see you soon. The owners are very nice. They greeted us as expected and even came over again when we left to say good bye and called us a cab. We were a family of 3 (small 6-month old baby) and were provided with a crib and a high chair, which was really useful. The apartment was clean and cosy and location was perfect, right in the heart of the city, walking distance of the two train stations and of the main sights. I would stay there again. Great all around experience in Turin! Thank you Yannick for the nice review. You were really very welcome guests. I hope to see you soon! Merci Yannick pour la belle critique. Vous étiez vraiment les bienvenus. J'espère vous revoir bientôt! Located in the heart of the city, opposite the Grande Hotel Sitea, 250 meters from the Egyptian Museum and 400 meters from Piazza Castello, a 10-minute walk from Porta Nuova Central Station and about 20 minutes from Porta Susa Station, half an hour taxi to Caselle Airport. 3 parking nearby. Bike sharing "Tobike" around the corner. All the most interesting tourist and cultural sites are just a few minutes away from the house. The nearest are: the Egyptian Museum, Palazzo Carignano, Palazzo Madama, the Royal Palace with Royal Gardens and the Risorgimento Museum, the Duomo with the Holy Shroud, the Teatro Regio, the Mole Antonellina with the Cinema Museum and are all to see! The most representative squares of Turin are: Piazza San Carlo, Piazza Castello and Piazza Vittorio. For a view of the city from the top and the surrounding mountains you can go to the Cappuccini mountain. Remaining in the city for lovers of walking or cycling, the Del Valentino park offers a green lung on the banks of the river Po (Turin is the 13th greenest city in the world) with its botanical garden and medieval castle. In the Torinese hill you can visit the Villa della Regina and the Basilica of Superga with its characteristic cog railway (the "Dentiera"). In the first belt of Turin you must visit the Reggia di Venaria, the hunting lodge of Stupinigi and the Castello di Rivoli with the most important exhibitions of the moment. A peculiarity of the city center of Turin are the arcades that allow tourists to move freely even on rainy days to shop in the shops that host the most important brands of the moment.